Surfing through Anime, Gundam, and J-Mags. 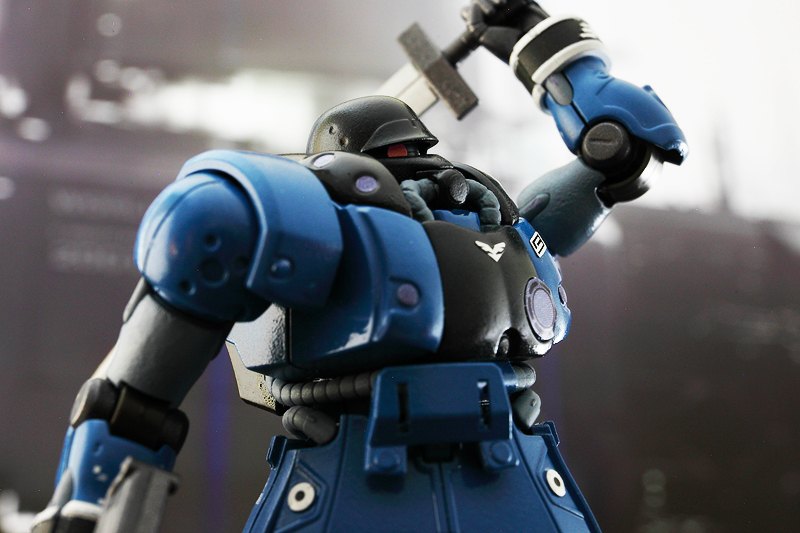 HGUC Zee Zulu with Kotobukiya gatling gun and heat sword from Bandai’s System Weapons line. 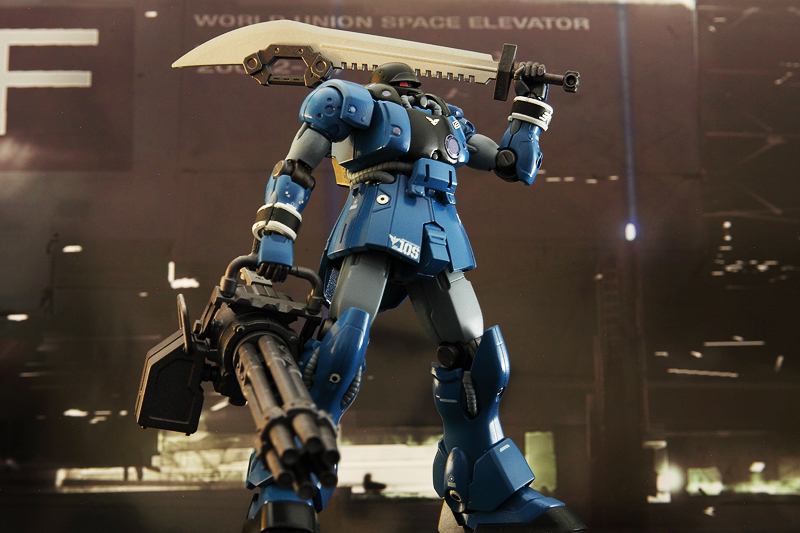 I’ve always wanted one of the Zulu mobile suits featured on the Gundam Unicorn OVAs but held off on getting one since there was always another mobile suit kit I was interested in. But I held off long enough and purchased the HGUC Zee Zulu. 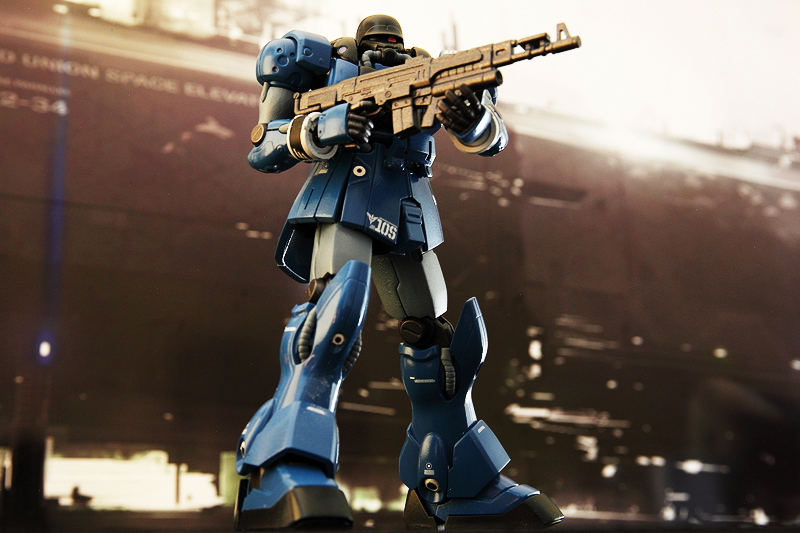 The Zee Zulu is the amphibious version of the Geara Zulu mobile suit and was developed by Neo Zeon. 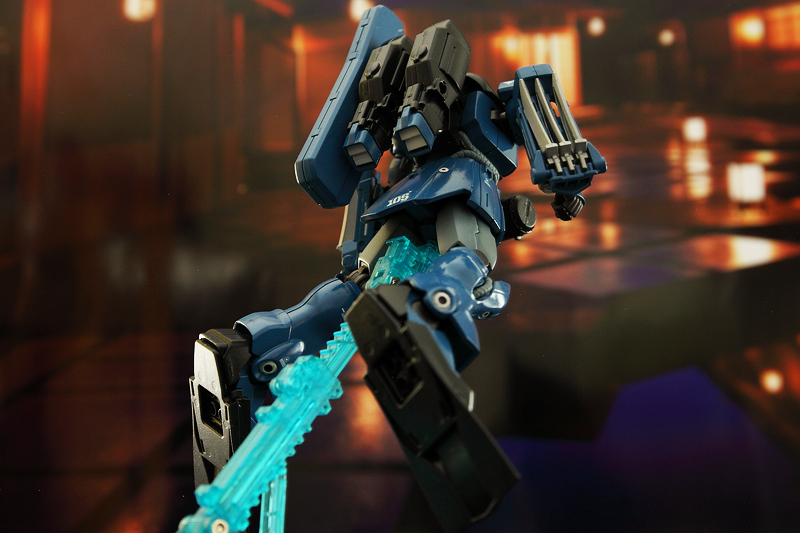 The design, which includes underwater gear and its blue color tones, reflects its main purpose of an aquatic assault mecha. The weapons the kit comes with are 2 heat claws attached to the wrists, 2 heat knvies and a beam rifle. 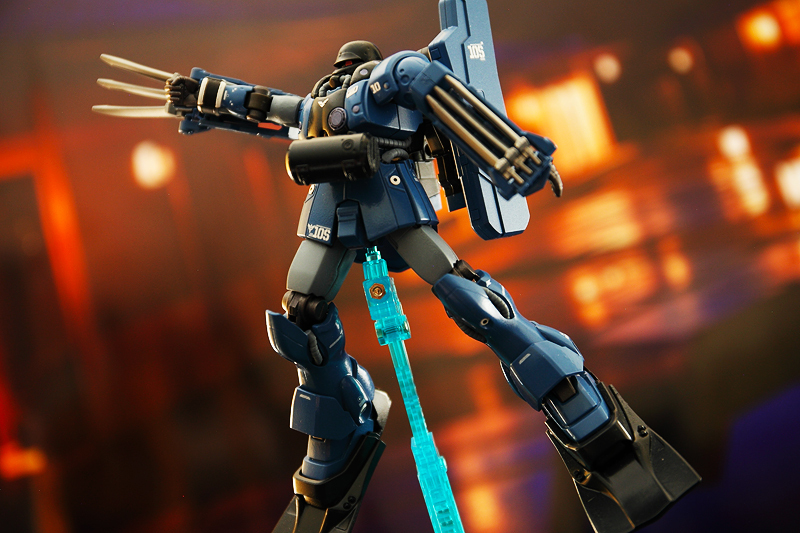 For this review I added Kotobukiya’s gatling gun and a giant heat sword that came with Bandai’s Builder’s Parts System Weapon 004. The kit also comes with flippers, an oxygen tank attached to the front of the waist, 2 power drives attached to the back and a container pack to store the beam rifle. HGUC Zee Zulu with amphibious gear and heat claws & knives. HGUC Zee Zulu with the 2 power drives attached to the back and the case containing the beam rifle. HGUC Zee Zulu with beam rifle. The kit was pretty much easy to put together, I think I may have put it all together in less than an hour after painting the kit. The few stickers that the kit came with really give the kit a much needed detail look. Specifically, where ever you see white and purple holes, those are stickers. I also applied a few waterslide decals from the HGUC Sinanju. I’m also getting used to hand painting the insignias on the wrists, after having a bit of hard last time with the HGUC Kshatriya. The kit comes with two hands to hold the knives, one hand to hold the beam rifle and an open hand. The poseability for the kit is about average for a High Grade. The hands and arms are great and can do a variety poses. The only thing that hinders the full movements of the arms are the shoulder armor plates. And the same can be said about the legs with some of its armor plating hindering some movements. For example you can’t do a kneeling pose with the Zee Zulu due to the armor plates in the back of the leg. You can turn the waist left to right, and move the torso a bit up. The head is basically static, although the peg allows you to raise the head a bit. There is also a mechanism at the bottom of the head where you can turn the mono eye left to right. 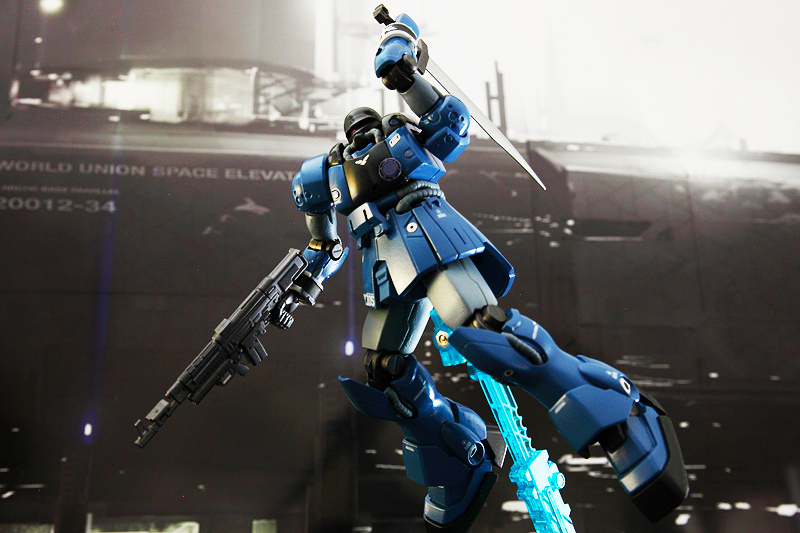 HGUC Zee Zulu with beam rifle and a heat sword from Bandai’s System Weapons line. HGUC Zee Zulu with aquatic gear. Overall I like the design of the Zee Zulu. 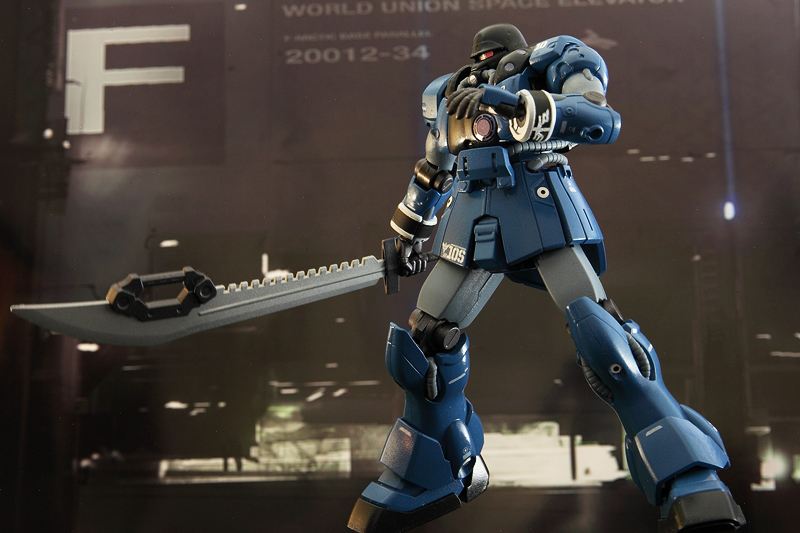 From the fins and oxygen tank, to the bluish toned colors of the mobile suit, it’s a really nice variation of the Geara Zulu for a specific environment in mind. 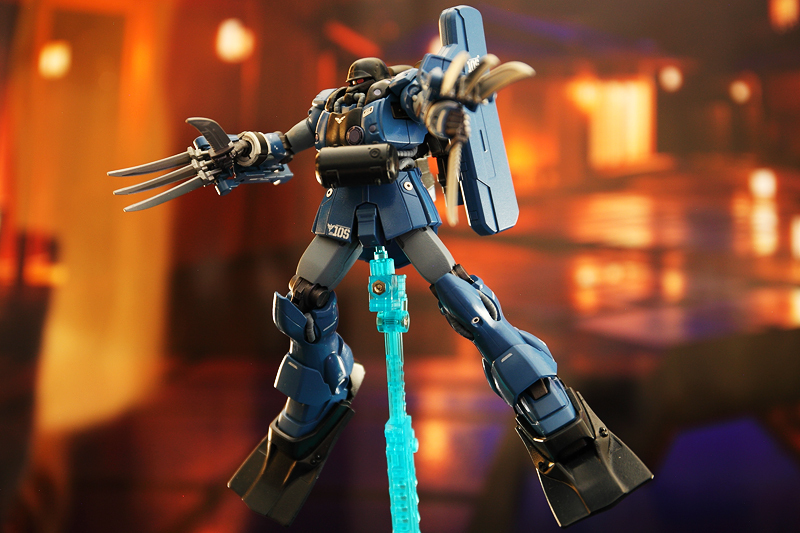 I really like the beam claws and they look pretty good with the knives attached to the hands. The beam rifle is a must it seems for the Zulu variations, and it looks good with this kit. I wish there was a bit more poseability in regards to the legs and arms, but what’s there should be sufficient enough for most, I guess what I really want is a Master Grade of this kit and the ability to do a kneeling pose. There’s more than enough variation on the kit from the original Geara Zulu to enjoy, especially if you’re into aquatic robots. I went a step further with this kit and purchased additional weapons, namely Kotobukiya’s gatling gun and Bandai’s System Weapon 004, which comes with three beam swords and a beam sniper rifle (which I’ll probably review some time down the line). HGUC Zee Zulu with Kotobukiya’s gatling gun. 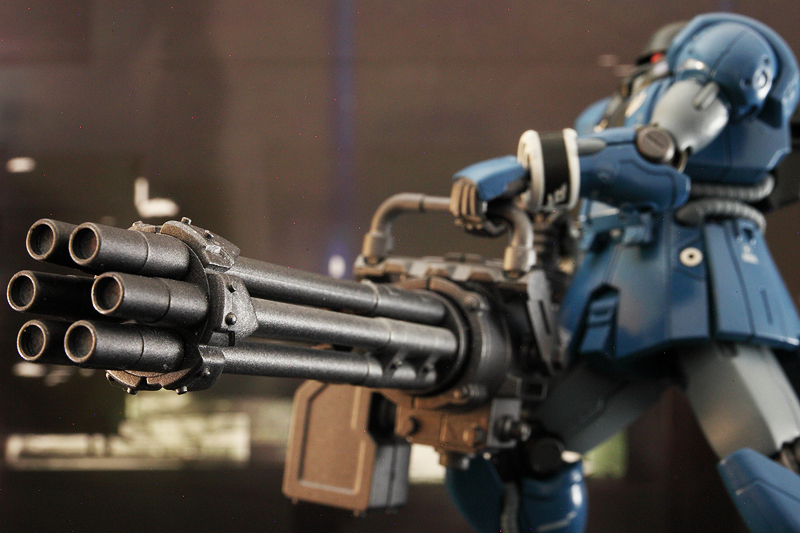 Kotobukiya’s gatling gun is enormous! Especially when you pair it up with a High Grade model. I’ve seen some pics and videos that have the weapon with a Master Grade. But with a High Grade like the Zee Zulu, it looks like a giant deadly weapon. I did have to file down the trigger handle in order for the kit’s hand to fit. As expected for something this size, it does weigh the hands and the kit itself down. 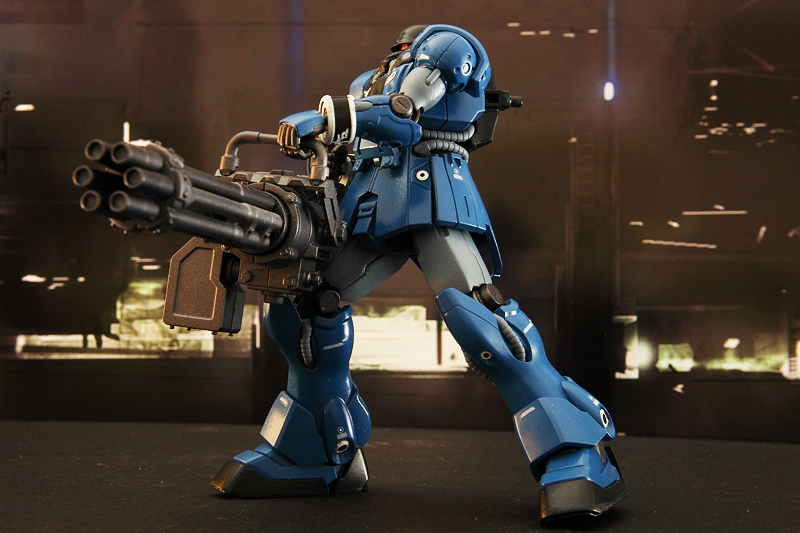 But with a little work, you can get the kit to properly handle the gatling gun and make it look good. 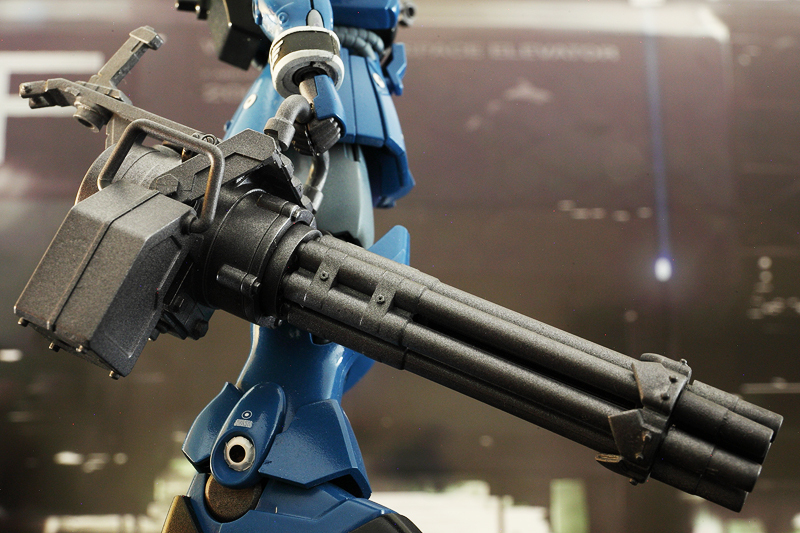 I know Kotobukiya’s made other weapons that can be used for Gundam models and I’ll look into getting a few. There is a special feature on the gun where you can wind up a little mechanism which allows the gun to rotate. I skipped that piece, but for anyone interested in that feature, it’s a nice one to have. 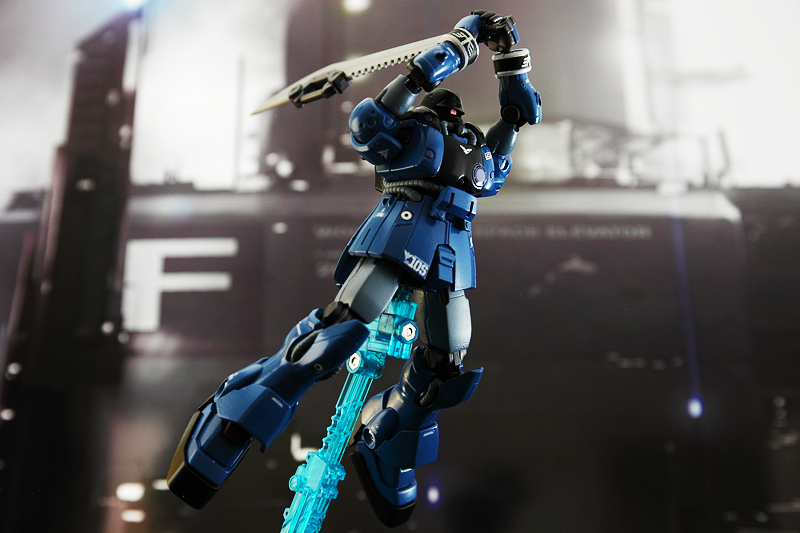 HGUC Zee Zulu with giant beam sword from Bandai’s System Weapon 004. 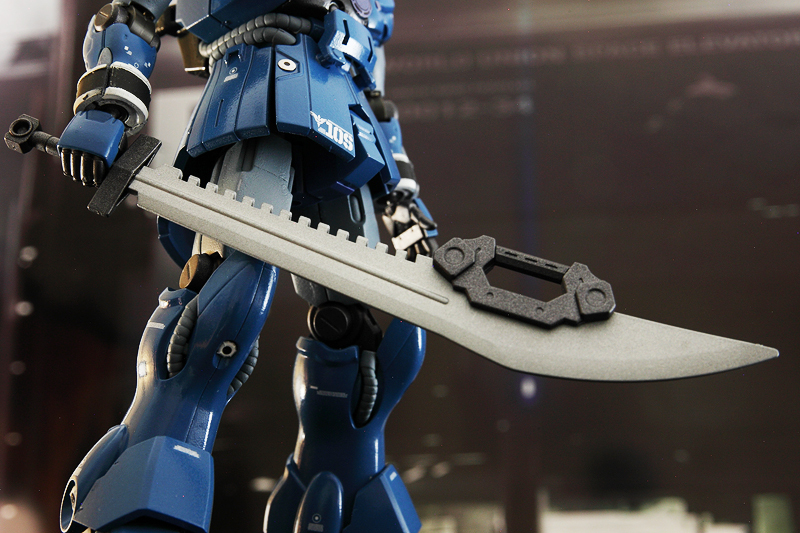 The giant beam sword from Bandai’s System Weapon 004 line is one of three blades that comes with the pack. I didn’t even realize that Bandai’s System Weapons line existed until I started searching online for third-party customized weapons for Gundams and came across weapons from Bandai made specifically for High Grade models. It helps A LOT that the pack comes with hands (and armor plates that you can paint) that can hold the weapon well. There is still going to be some tilting of the hands, depending on how you pose the sword, but it’s not to the point where it’s a major problem where you can’t get a decent pose out of the weapon. I hope Bandai continues with these weapons as the packs that are out look pretty superb. Preparation for MG Nu Gundam Ver. Ka...and I'm back!